The Barefoot Beach House is one of the nicest guest house offered in South Palmetto Point...just south of Governor's Harbour in Eleuthera. This is offered as a 2 bed/2bath. See Home Away 4279742 for an additional bedroom and bath if you need 3bed/3baths. Step out the door to a beautiful crystal clear turquoise beach. We have a rowboat that can double as a sailboat, a canoe and kayaks for your use. Inside the tropically decorated home you will have all the luxuries of home...hair dryer, iron, cable TV, WI FI ,games & water toys. Fully equipped kitchen and 8' wrap around patio with patio furniture and gas grills. Relax in the hammock under the palm trees, catch a bonefish right off the beach, explore the many beaches on the island, take day trips to the north & south and do some island exploring or just relax on the sandy beach and soak up some sun. Come back and enjoy the oversized shower with room for 2 or sit out on the patio and enjoy the stars that sparkle like diamonds in the sky. Easy commute to local attractions: Located about the middle of the island it makes it great for day trips to the north and south. We offer a book with directions to all the beaches and attractions...explore at your leisure. There are several stores and restaurants located within a 5-7 mile radius. You might not want to leave the property as we are located on a sandy beach and have a boat that can double as a sailboat, a canoe and kayaks for your use. Enjoy relaxing in the swaying hammock under the palm trees, work on your tan on the beach or explore the island and find hidden beaches. With our unique location we have sunrises to the east over a point of land and sunsets over the Pineapple Cays which are right off shore. You will have breathtaking views of the stars at night..like diamonds in the sky. You will find The Barefoot Beach House relaxing, squeaky clean and comfortable. Please leave all your worries at home. We expect you to relax...we even provide you with a complimentary BOTTLE OF LOCAL RUM! Our motto is: Enter as a guest, leave as a friend. Once you have visited Eleuthera you will not want to go home. With our repeat guests we know that you will want to come back again and again. Step right out front to a beautiful sandy beach with reclining beach chairs for your use. We are located right on a sandy beach. We have beach recliners on the beach for your use. The Pineapple Cays are right out front so gives you places for fishing and snorkeling. We are located on a sandy beach on the Caribbean side of the island, with the beautiful Pineapple Cays out front. Full size refrig. We give you your first gallon of water. We have all the dishes and utensils you will need for cooking. Dining table sits 6 plus we have booster chair for kids. The Barefoot Beach House is a NON-SMOKING property. Just spent a week at the Barefoot Beach House for my honeymoon. Perfect centralized location on the island when looking from North to South. The house is just a few steps from the beach which you can't beat. Inside is clean and has everything you need for your stay, including towels, kitchen equipment and gas grill. There are beach chairs, snorkel gear, kayaks, etc. There are the 4 cays just offshore that are neat to kayak and snorkel around. Water is shallow and clear. Skip and Sharon are nice and leave you to privacy but they are there if you need them for anything. There are a few grocery stores in Governor's Harbour about 7-8 miles away. We flew down with frozen steaks, chicken and lunch meat per other reviews which turned out to be a great move as the grocery stores don't have the best inventory from a fresh meats standpoint. You can get fresh vegetables and plenty of dry food. There is a great pizza place 1/2 mile away Skip can call in an order for you to pick up and bring back if you don't want to eat there. We went to Tippy's for lunch a few days which is on the beach on the Atlantic side which was fun and Fish Bones a few miles south which was also nice. If you like fresh conch salad, you can't miss Sterling who makes it in his front yard in Governer's Harbour, a few houses down from the Buccaneer Club. If you are looking for a lot of nightlife or fancy places, this island is not for you. We didn't pack nice clothes as t-shirts were the norm. Rental car was old but that is what is expected down there. If you do like beaches, this island is as good as it gets. Most of the time you would see no more than 2-4 people on the beach as far as you could see. We took a trip to the southern tip and saw Lighthouse Beach which is spectacular, where the Atlantic and Caribbean side meet. The colors are unreal and the beaches are beautiful. You will need an SUV to get there as the last 7 plus miles are very rough unpaved roads and you will need the clearance. It probable takes 1.5 hours door to door from the Barefoot Beach house. Don't miss it if you have the time and an SUV (you don't need 4 wheel drive). We flew into North Eleuthera Airport as it was a little cheaper than Governors Harbour Airport. The drive was about an hour south. On the way out, we ate lunch at the Glass Window Bar & Grill by the glass window bridge which is a neat dive. Can't wait to come back to Eleuthera. We loved having you as guests! Thank you for the wonderful and informative review...our beautiful island will usually not disappoint you. We look forward to seeing you back again!! What can I say that has not already been said about this place!? 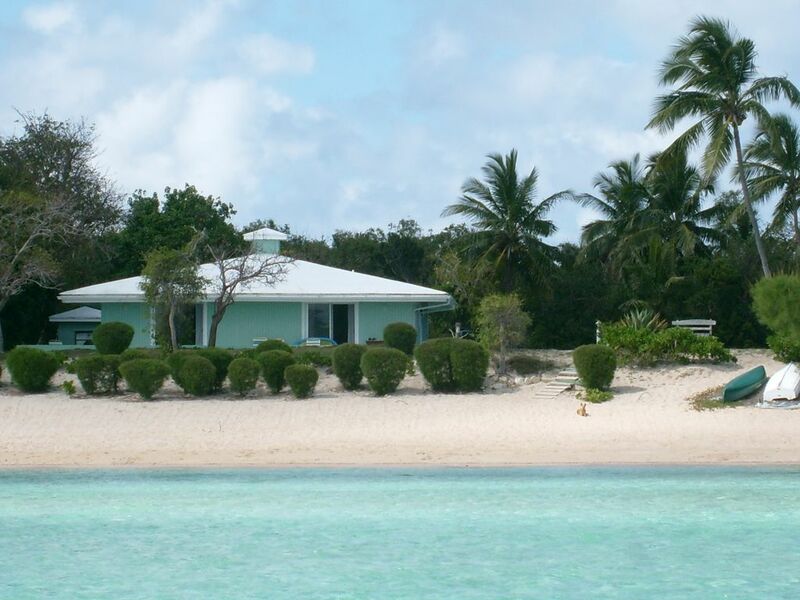 The Barefoot Beach House, Sharon and Skip, and Eleuthera are all wonderful. My family stayed for 10 nights and we had a very comfortable, enjoyable, scenic, relaxing, convenient, tasty, fun filled vacation. Our teenage boys had a blast snorkelling, skimboarding and making sand castles at every beach we visited. We thoroughly enjoyed the convenience of our 'island cruiser' as it allowed us to explore the many beaches, sites, and shops on Eleuthera. We truly enjoyed slowing down, focusing on what matters, and eating simple wholesome foods. All the best, Skip and Sharon! We hope to return sooner than later. We totally enjoyed having you as guests and hope to see you all back soon. Thanks for getting Skip out in the boat...wish you could have caught some dolphin or tuna. Thanks for the clean unit...you were the perfect guests!! Very nice and beautiful location right on the beach! The house had more than we expected to enjoy our stay. Highly recommended. We will stay again. Clean, comfy beds, beautiful view of carribean, central location accessible to all areas. We travelled from the UK to Eleuthera with our two young children (ages 5 & 7) and spent 12 wonderful days at The Barefoot Beach House. We thoroughly enjoyed our trip and felt immediately relaxed upon arrival, with the beautiful Caribbean Sea on our doorstep and the homely surrounds of the beach house, which the pictures here don't really do justice to. Sharon & Skip are very experienced and professional hosts, they've worked hard to create a fabulous holiday home and they're very helpful without being at all intrusive. The house is fully equipped and has everything you could possibly think of, plus loads more and the beds are VERY comfortable! The location is also great for exploring the beaches on the island - It's right in the middle, so you can easily head North and South (beautiful beaches in every direction) and there's a lovely farm shop just 2mins up the road for fresh produce. We spent plenty of time on the beach outside the house too, it was quiet there and the water is shallow, which was perfect for the children and gave me plenty of peace of mind. They had a few goes on the kayaks and walked/swam out to the nearest cay when the tide was low. We felt very safe in Eleuthera and the people there and island vibe is very relaxed and laid back. Hopefully we'll come back one day and in the meantime I'll be recommending The Barefoot Beach House to all my friends! Thank you again. It was a pleasure meeting all of you and having you as guests!! Both of your children are so cute and well behaved. It was fun seeing them run around in the yard trying to get pictures of the wild chickens. Hopefully we will see you again!! I would recommend you as guests to anyone. Great place. Great location. Great a amenities. Home away from home. We had a wonderful time at the Barefoot Beach House! The house is very clean and well supplied with towels and the kitchen had everything we needed and more. The rum was a wonderful touch. The owners anticipated all our needs.The house was located in a quiet location which gave a real feel of the island and its simple serenity. Great trip. We will definitely return. We enjoyed having you as guests!! We look forward to seeing you again. Other Activities: Venture out to explore the island...beautiful unspoiled beaches, hidden caves, sea cliffs and stars at night. The rate above gives you 2 bedrooms and 2 baths. We can close off one bedroom if you want, ask for pricing. For a smaller unit for a couple please see #4279742. This unit can be added if you need 3 bedrooms.